Scan the skies for the Northern Lights on this nighttime tour from Reykjavik. Traveling by minibus with a panoramic roof, you’ll head into the countryside, far away from any urban lights. Warm up with mugs of hot cocoa and local treats, or snuggle up with cozy blankets on board the minibus. You’ll also have peace of mind with this tour’s Northern Lights guarantee: If you don’t see the lights, you’ll be offered another tour. 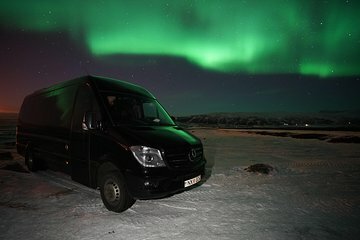 We were lucky enough to go on this tour on our first night in Iceland and the lights did not disappoint. Starting to be visible at dusk whilst waiting for the minibus, we were picked up and driven away from the light pollution of Reykjavik where they danced for us clearly for the next three hours. This tour was well organized, the minibus was small, accommodating approx 16 people. It was also warm, with free wifi on board and charging capabilities via USB cable if needed. The guide was knowledgeable both about the lights and how best to photograph them. He was also willing to take photos of us all which were subsequently loaded onto Facebook. The hot chocolate and traditional snacks were also much appreciated. Fantastic tour, would recommend to anyone.